Phraya Phahonphonphayuhasena (Thai: พระยาพหลพลพยุหเสนา, Thai pronunciation: [pʰrá.jaː.pʰá.hǒn.pʰon.pʰá.jú.hà.sě.naː]), 29 March 1887 – 14 February 1947), short Phraya Phahon, born as Phot Phahonyothin (Thai: พจน์ พหลโยธิน), was a Thai military leader and politician. He became the second prime minister of Siam in 1933 after ousting his predecessor in a coup d'état. He retired in 1938 after serving five years as prime minister. Phot was born in Phra Nakhon Province (present-day Bangkok) to a Teochew Thai Chinese father, Colonel Kim Phahonyothin (กิ่ม พหลโยธิน), and a Thai Mon mother, Chap Phahonyothin (จับ พหลโยธิน). After attending the Chulachomklao Royal Military Academy, in 1903 he was sent by royal scholarship to study at the Prussian Military Academy (Preußische Hauptkadettenanstalt) in the town of Lichterfelde, near Berlin, Germany, where he was apparently a classmate of Hermann Göring and became acquainted with Hideki Tojo through sword duels. Phot was then sent to study at the Engineering College of Copenhagen in Denmark, he was however only able to complete one year as his scholarship funds had run out, he returned to Siam in 1912. In 1931 he was elevated to the title of Phraya Phahonphonphayuhasena by King Prajadhipok (or Rama VII) and received the rank of colonel. 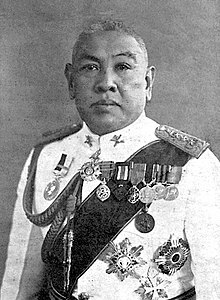 In 1932 he became Commander of the Royal Siamese Army. Phraya Phahon was an important member of the group of conspirators known as the "Four Musketeers", (4 ทหารเสือ) which were a part of the Khana Ratsadon (or the People's Party) who carried out the revolution of 1932. After the 1932, three factions had formed among the group of Siamese political and military leaders in the Khana Ratsadon. These were: first, the senior military faction led by Phraya Phahon; second, the junior army and navy faction led by Luang Phibunsongkhram; and third, the civilian faction led by Pridi Phanomyong. As the most senior Phraya Phahon was viewed as the de facto leader of the Khana Ratsadon and the revolution itself. It was Phraya Phahon who read the Declaration of the New Siamese State in the Royal Plaza that declared the end of absolute monarchy and the establishment of the constitutional Siamese state. Because of the key role he played in the revolution he was rewarded with a high position in the new government and was made a member of the new cabinet. In March 1933 a constitutional crisis has developed in Siam over the Yellow Cover Dossier incident, the incident was caused by Pridi's draft economic plan, which contained many socialistic elements. Because of this Phraya Manopakorn Nititada the prime minister decided to expel him from the cabinet and suspended the constitution. This action upset many in the People's Party who supported Pridi, this included Phraya Phahon. On 15 June Phraya Phahon resigned from the cabinet citing 'health reasons'. In truth he and a couple of military officers including both Army and Navy officers has planned to overthrow Phraya Mano's increasingly authoritarian government. On 20 June a bloodless coup was instigated, led by Phraya Phahon. The following day, Phraya Phahon appointed himself the second prime minister of Siam. He immediately send a report to King Prajadhipok the objectives and reasoning for the coup and asked the king's support, the king reluctantly endorsed him. Phraya Mano was then exiled to Malaysia. The next five years were a struggle to maintain power. Beginning with the Boworadet Rebellion only four months after becoming prime minister in October 1933; a royalist revolt against Phraya Phahon's government. After weeks of fighting government troops emerged victorious and Phraya Phahon was able to cement his power over Siam. The cabinet was extremely divided politically, and the government was maintained only by the personality of Phraya Phahon. Luang Phibunsongkhram (a trusted confidant) became minister of defence under the new government, and he began to acquire greater power and influence in preparation for his eventual ascension to the premiership. The beginning of the end for Phraya Phahon’s time as prime minister began in 1937 when a scandal erupted involving sale of crown real estate to high-ranking officials for below-market prices. After a near collapse that year, the first direct elections for the People's Assembly took place on 7 November 1937, and those of Phraya Phahon’s cabinet found themselves an ideological and political minority. After budget issues the next year, the cabinet was forced to resign in September 1938, and elections were held in December, installing Luang Phibunsongkhram as the next prime minister of Thailand. After his difficult years as prime minister, General Phraya Phahon retired from public life, though he served as Inspector-General of the Royal Thai Armed Forces during World War II. He died in February 1947 at the age of 59 of cerebral haemorrhage. It was said that when he died, despite the fact that he has held many positions in government, his family was poor and did not even have the money to pay for his funeral. Eventually Luang Phibunsongkhram, his former tutee and the current prime minister had to step in and pay for the funeral of his beloved mentor. Phahonyothin Road, which runs from Bangkok to the border of Burma in the north, is named after Phraya Phahon. Formerly known as Prachathipatai Road, Field Marshal Plaek Phibunshongkhram renamed the road in his honour. A hospital in Kanchanaburi Province is also named in his honour. ^ George William Skinner (1957). Chinese Society in Thailand: An Analytical History. Cornell University Press. p. 244. ^ D. Insor (1957). Thailand: A Political, Social, and Economic Analysis. Praeger. p. 138. ^ "ทายาทพระยาพหลฯ เล่าถึงคณะราษฎรในความทรงจำ ทั้งชีวิตยอมปฏิวัติ 24 มิ.ย.ได้ครั้งเดียว". Prachatai (in Thai). June 30, 2012. Retrieved April 17, 2017. This page was last edited on 19 February 2019, at 01:39 (UTC).